"Political asylum" redirects here. For other uses, see Political asylum (disambiguation). Asylum seekers by country of origin in 2009. 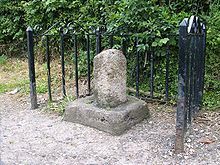 Remains of one of four medieval stone boundary markers for the sanctuary of Saint John of Beverley in the East Riding of Yorkshire. 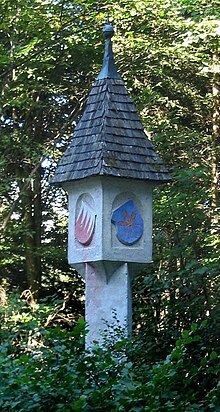 Medieval boundary marker at St. Georgenberg, Tyrol. The right of asylum (sometimes called right of political asylum, from the Ancient Greek word ἄσυλον) is an ancient juridical concept, under which a person persecuted by one's own country may be protected by another sovereign authority, such as another country or church official, who in medieval times could offer sanctuary. This right was recognized by the Egyptians, the Greeks, and the Hebrews, from whom it was adopted into Western tradition. René Descartes fled to the Netherlands, Voltaire to England, and Thomas Hobbes to France, because each state offered protection to persecuted foreigners. The Egyptians, Greeks, and Hebrews recognized a religious "right of asylum", protecting criminals (or those accused of crime) from legal action to some extent. This principle was later adopted by the established Christian church, and various rules were developed that detailed how to qualify for protection and what degree of protection one would receive. The Council of Orleans decided in 511, in the presence of Clovis I, that asylum could be granted to anyone who took refuge in a church or on church property, or at the home of a bishop. This protection was extended to murderers, thieves and adulterers alike. That "Everyone has the right to seek and to enjoy in other countries asylum from persecution" is enshrined in the United Nations Universal Declaration of Human Rights of 1948 and supported by the 1951 Convention Relating to the Status of Refugees and the 1967 Protocol Relating to the Status of Refugees. Under these agreements, a refugee is a person who is outside that person's own country's territory owing to fear of persecution on protected grounds, including race, caste, nationality, religion, political opinions and participation in any particular social group or social activities. Sometimes the criminal had to get to the chapel itself to be protected, or ring a certain bell, hold a certain ring or door-knocker, or sit on a certain chair ("frith-stool"). Some of these items survive at various churches. Elsewhere, sanctuary held in an area around the church or abbey, sometimes extending in radius to as much as a mile and a half. Stone "sanctuary crosses" marked the boundaries of the area; some crosses still exist as well. Thus it could become a race between the felon and the medieval law officers to the nearest sanctuary boundary. Serving of justice upon the fleet of foot could prove a difficult proposition. Church sanctuaries were regulated by common law. An asylum seeker had to confess his sins, surrender his weapons, and permit supervision by a church or abbey organization with jurisdiction. Seekers then had forty days to decide whether to surrender to secular authorities and stand trial for their alleged crimes, or to confess their guilt, abjure the realm, and go into exile by the shortest route and never return without the king's permission. Those who did return faced execution under the law or excommunication from the Church. If the suspects chose to confess their guilt and abjure, they did so in a public ceremony, usually at the church gates. They would surrender their possessions to the church, and any landed property to the crown. The coroner, a medieval official, would then choose a port city from which the fugitive should leave England (though the fugitive sometimes had this privilege). The fugitive would set out barefooted and bareheaded, carrying a wooden cross-staff as a symbol of protection under the church. Theoretically they would stay to the main highway, reach the port and take the first ship out of England. In practice, however, the fugitive could get a safe distance away, abandon the cross-staff and take off and start a new life. However, one can safely assume the friends and relatives of the victim knew of this ploy and would do everything in their power to make sure this did not happen; or indeed that the fugitives never reached their intended port of call, becoming victims of vigilante justice under the pretense of a fugitive who wandered too far off the main highway while trying to "escape." Knowing the grim options, some fugitives rejected both choices and opted for an escape from the asylum before the forty days were up. Others simply made no choice and did nothing. Since it was illegal for the victim's friends to break into an asylum, the church would deprive the fugitive of food and water until a decision was made. During the Wars of the Roses, when the Yorkists or Lancastrians would suddenly get the upper hand by winning a battle, some adherents of the losing side might find themselves surrounded by adherents of the other side and not able to get back to their own side. Upon realizing this situation they would rush to sanctuary at the nearest church until it was safe to come out. A prime example is Queen Elizabeth Woodville, consort of Edward IV of England. In 1470, when the Lancastrians briefly restored Henry VI to the throne, Queen Elizabeth was living in London with several young daughters. She moved with them into Westminster for sanctuary, living there in royal comfort until Edward IV was restored to the throne in 1471 and giving birth to their first son Edward V during that time. When King Edward IV died in 1483, Elizabeth (who was highly unpopular with even the Yorkists and probably did need protection) took her five daughters and youngest son (Richard, Duke of York) and again moved into sanctuary at Westminster. To be sure she had all the comforts of home, she brought so much furniture and so many chests that the workmen had to knock holes in some of the walls to get everything in fast enough to suit her. Henry VIII changed the rules of asylum, reducing to a short list the types of crimes for which people were allowed to claim asylum. The medieval system of asylum was finally abolished entirely by James I in 1623. Article 14 of the Universal Declaration of Human Rights states that "Everyone has the right to seek and to enjoy in other countries asylum from persecution." The United Nations 1951 Convention Relating to the Status of Refugees and the 1967 Protocol Relating to the Status of Refugees guides national legislation concerning political asylum. Under these agreements, a refugee (or for cases where repressing base means has been applied directly or environmentally to the refugee) is a person who is outside that person's own country's territory (or place of habitual residence if stateless) owing to fear of persecution on protected grounds. Protected grounds include race, caste, nationality, religion, political opinions and membership or participation in any particular social group or social activities. Rendering true victims of persecution to their persecutor is a violation of a principle called non-refoulement, part of the customary and trucial Law of Nations. These are the accepted terms and criteria as principles and a fundamental part in the 1951 United Nations Convention Relating to the Status of Refugees non-refoulement order. Since the 1990s, victims of sexual persecution (which may include domestic violence, or systematic oppression of a gender or sexual minority) have come to be accepted in some countries as a legitimate category for asylum claims, when claimants can prove that the state is unable or unwilling to provide protection. Asylum in European Union member states formed over a half-century by application of the Geneva Convention of 28 July 1951 on the Status of Refugees. Common policies appeared in the 1990s in connection with the Schengen Agreement (which suppressed internal borders) so that asylum seekers unsuccessful in one Member State would not reapply in another. The common policy began with the Dublin Convention in 1990. It continued with the implementation of Eurodac and the Dublin Regulation in 2003, and the October 2009 adoption of two proposals by the European Commission. France was the first country to recognize the constitutional right to asylum, this being enshrined in article 120 of the Constitution of 1793. The modern French right of asylum is recognized by the 1958 Constitution, vis-à-vis the paragraph 4 of the preamble to the Constitution of 1946, to which the Preamble of the 1958 Constitution directly refers. The Constitution of 1946 incorporated of parts of the 1793 constitution which had guaranteed the right of asylum to "anyone persecuted because of his action for freedom" who are unable to seek protection in their home countries. In addition to the constitutional right to asylum, the modern French right to asylum (droit d'asile) is enshrined on a legal and regulatory basis in the Code de l'Entree et du Sejour des Etrangers et du Droit d'Asile (CESEDA). France also adheres to international agreements which provide for application modalities for the right of asylum, such as the 1951 United Nations (UN) Convention Relating to the Status of Refugees (ratified in 1952), the additional 1967 protocol; articles K1 and K2 of the 1992 Maastricht Treaty as well as the 1985 Schengen Agreement, which defined EU immigration policy. Finally, the right of asylum is defined by article 18 of the Charter of Fundamental Rights of the European Union. Some of the criteria for which an asylum application can be rejected include: i) Passage via “safe" third country, ii) Safe Country of Origin (An asylum seeker can be a prior refused asylum if he or she is a national of a country considered to be "safe" by the French asylum authority OFPRA), iii) Safety Threat (serious threat to the public order), or iv) Fraudulent Application (abuse of the asylum procedure for other reasons). The notion of "internal asylum": the request may be rejected if the foreigner may benefit from political asylum on a portion of the territory of their home country. The OFPRA (Office français de protection des réfugiés et apatrides – French Office for the Protection of Refugees and Stateless Persons) now makes a list of allegedly "safe countries" which respect political rights and principles of liberty. If the demander of asylum comes from such a country, the request is processed in 15 days, and receives no social assistance protection. They may contest the decision, but this does not suspend any deportation order. The first list, enacted in July 2005, included as "safe countries" Benin, Cape Verde, Ghana, Mali, Mauritius Island, India, Senegal, Mongolia, Georgia, Ukraine, Bosnia and Croatia. It had the effect of reducing in six months by about 80% the number of applicants from these countries. The second list, passed in July 2006, included Tanzania, Madagascar, Niger, Albania and Macedonia. While restricted, the right of political asylum has been conserved in France amid various anti-immigration laws. Some people claim that, apart from the purely judicial path, the bureaucratic process is used to slow down and ultimately reject what might be considered as valid requests. According to Le Figaro, France granted 7,000 people the status of political refugee in 2006, out of a total of 35,000 requests; in 2005, the OFPRA in charge of examining the legitimacy of such requests granted less than 10,000 from a total of 50,000 requests. Numerous exiles from South American dictatorships, particularly from Augusto Pinochet's Chile and the Dirty War in Argentina, were received in the 1970s-80s. Since the 2001 invasion of Afghanistan, tens of homeless Afghan asylum seekers have been sleeping in a park in Paris near the Gare de l'Est train station. Although their demands haven't been yet accepted, their presence has been tolerated. However, since the end of 2005, NGOs have been noting that the police separate Afghans from other migrants during raids, and expel via charters those who have just arrived at Gare de l'Est by train and haven't had time to demand asylum (a May 30, 2005, decree requires them to pay for a translator to help with official formalities). In the 19th century, the United Kingdom accorded political asylum to various persecuted people, among whom were many members of the socialist movement (including Karl Marx). With the 1845 attempted bombing of the Greenwich Royal Observatory and the 1911 Siege of Sidney Street in the context of the propaganda of the deed (anarchist) actions, political asylum was restricted. The United States recognizes the right of asylum of individuals as specified by international and federal law. A specified number of legally defined refugees who apply for refugee status overseas, as well as those applying for asylum after arriving in the U.S., are admitted annually. Since World War II, more refugees have found homes in the U.S. than any other nation and more than two million refugees have arrived in the U.S. since 1980. During much of the 1990s, the United States accepted over 100,000 refugees per year, though this figure has recently decreased to around 50,000 per year in the first decade of the 21st century, due to greater security concerns. As for asylum seekers, the latest statistics show that 86,400 persons sought sanctuary in the United States in 2001. Before the September 11 attacks individual asylum applicants were evaluated in private proceedings at the U.S. Immigration and Naturalization Services (INS). "Perhaps the most perplexing component of the Iraq refugee crisis... has been the inability for the U.S. to absorb more Iraqis following the 2003 invasion of the country. To date, the U.S. has granted less than 800 Iraqis refugee status, just 133 in 2007. By contrast, the U.S. granted asylum to more than 100,000 Vietnamese refugees during the Vietnam War." ^ "Asylum – Definition". Merriam-Webster Dictionary. Retrieved 2012-08-17. ^ "asylum (n.)". Online Etymology Dictionary. ^ "Convention and Protocol Relating to the Status of Refugees". ^ Prof. Vincent Chetail (2008-09-16). "Helène Lambert, Francesco Messineo, and Paul Tiedemann, COMPARATIVE PERSPECTIVES OF CONSTITUTIONAL ASYLUM IN FRANCE, ITALY, AND GERMANY: REQUIESCAT IN PACE?, Refugee Survey Quarterly, Vol. 27, No. 3" (PDF). Refugee Survey Quarterly. 27 (3): 16–32. doi:10.1093/rsq/hdn043. Retrieved 2013-07-10. ^ "Code de l'entrée et du séjour des étrangers et du droit d'asile" (in French). Legifrance. Retrieved 2013-07-10. ^ "Authority delegated to OFPRA by art. L. 722-1 of Code de l'entrée et du séjour des étrangers et du droit d'asile, J.O., 4 December 2009". Legifrance.gouv.fr. ^ Schuster, Liza (Winter 2010). "The park near the Gare de l'Est: 'Just waiting to go, to move on'" (PDF). Translocations: Migration and Social Change. 6 (2). Archived from the original (PDF) on 4 March 2016. Retrieved 29 December 2012. ^ "PAJOL | Expulsion collective des afghans : non à l'arbitraire et à l'illégalité !". Pajol.eu.org. Retrieved 2012-08-17. ^ Lattek, Christine (2006-01-01). Revolutionary Refugees: German Socialism in Britain, 1840-1860. Psychology Press. ISBN 9780714651002. ^ Black, Gerry (2003-10-13). Jewish London: an illustrated history. Breedon. ISBN 9781859833636. ^ "Asylum Seekers (most recent) by country". Nationmaster.com. Retrieved 2012-08-17. ^ "Global Views: Iraq's refugees, by R. Nolan, Foreign Policy Association Features, Resource Library, June 12, 2007. Peter Fell and Debra Hayes, What are they doing here? A critical guide to asylum and immigration. Birmingham, Venture Press, 2007. Program in Refugee and Asylum Law, University of Michigan Law School. Wikimedia Commons has media related to Right of asylum. This page was last edited on 16 April 2019, at 21:22 (UTC).